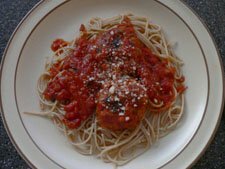 The variety of meatball recipes come from my close friends and family they have shared with me many years ago. When I make a batch of meatballs, I always double or even triple the recipe. 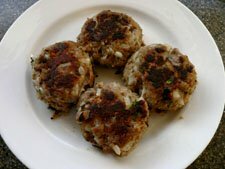 Make half the meat mixture into small meatballs, brown them up and freeze for a meal or appetizer later. 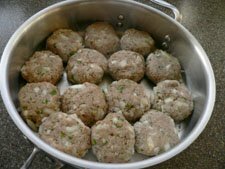 Mix all ingredients except oil and flour, and make meatballs slightly larger than the size of golf ball. Dust meatballs with flour. Oil pan lightly and brown meatballs. If using Italian flavored breadcrumbs omit the Oregano and basil herbs. Put meatballs in your favorite Marinara Sauce, heat thoroughly and pour over cooked spaghetti noodles. Top with grated Romano or Parmesan cheese. Add Salad and Crusty Bread for a complete well balanced meal. Have some herb flavored olive oil for dipping bread into. Make the meatballs a little smaller than a golf ball and serve on a bed of rice mixed with a side of steamed broccoli. 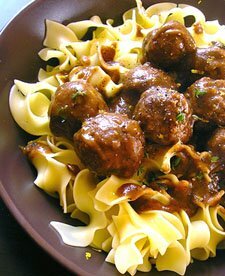 Mix smaller meatballs in BBQ sauce for an easy party dish. Tip: These meatballs freeze well. Keep in a zipper freezer bag for a quick and easy meal or appetizer. Soak the bread crumbs in the milk for 15 minutes. In a small saucepan saute minced onion in 1 Tbl butter until translucent, about 3 minutes. Mix the softened bread, cooked onion and ground meat well. Add eggs, salt, pepper, nutmeg and paprika. Mix thoroughly. Shape the mixture into small size balls, dusting your hands with flour while shaping the balls. In a large frying pan, melt the remaining 3 Tbl butter and add the meatballs. Fry until golden brown all over. Remove from pan and set aside. Stir the flour into drippings until well blended. Add the water and dash of pepper. Cook, stirring constantly until thickened. Reduce heat to low and cook for 5 minutes. Stir in the sour cream, a rounded tablespoon at a time, stirring until thoroughly blended after each addition. Add mushrooms. Return the meatballs to the gravy, cover pan and simmer very gently for 10 minutes. Put onto a bed of wide noodles and sprinkle with finely chopped parsley. Of all the meatball recipes this is my favorite. My Greek mother-in-law made meatballs often and this is her recipe. I love the hint of mint in the meat. Soak the bread in milk. Set aside and prepare the rest of the ingredients. Combine meats (I like 1/2 lamb and 1/2 beef), soaked bread, onion, spearmint, parsley, salt, and pepper. In large sauce pan heat butter and oil over medium temperature. With wet hands, shape meat mixture into balls adding to the pan as you go. I like to make the meatballs a little larger than golf ball size. Cook balls for about 15 minutes, moving the meatballs around to brown evenly and on all sides. Remove meatballs from pan and set to side. De-glaze pan with wine and allow wine to reduce by half for a couple minutes. Return meatballs to pan and squeeze the juice of 1/2 lemon over the meatballs. Serving Suggestions: Serve with spaghetti noodles drizzled with browned butter, sprinkled with grated Romano or Parmesan cheese. Have a Greek salad on the side with some garlic bread slices.